A recipe for Healthy Baked Turkey Meatballs using lean ground turkey, Italian spices, and definitely not sacrificing in flavor. Happy Friday! I could not be more excited for today as it’s my last day of work before a week off for Spring Break. Wahoo! My little sister will be visiting for part of the week from California, so I’ll be spending a good part of the weekend getting the house ready for her arrival. You better believe her visit will include a lot of delicious food, fitness, and fun like when I went out west to see her. Be sure to follow along on Instagram. Now for todays recipe. 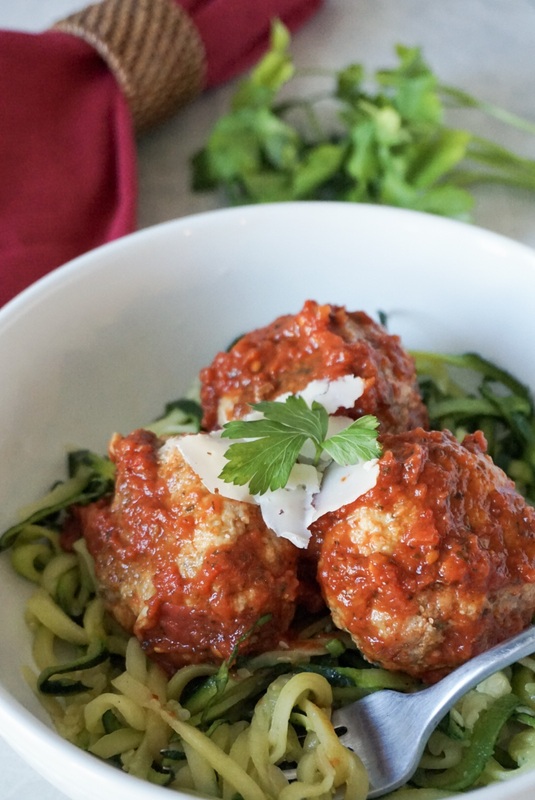 I’m surprised it took me so long to share these Healthy Baked Turkey Meatballs with you because they are a hit in our house for a quick meal during the week or a date night in. I also always prepare them for small social gatherings as they are easy to make ahead of time and reheat in a crockpot. I use ground turkey and bake them to make them a little leaner. And I prefer serving with a side of zucchini noodles over regular pasta to make it a low carb meal. I initially made turkey meatballs with just the 99% fat free turkey and they were way too dry. So the next time I experimented with this recipe I mixed 93% lean turkey and 99%, my grocery store carries Shady Brook Farms ground turkey that I really enjoy. With some panko, eggs, and spices, the combo of the two different ground turkey meats was perfect. And since I used two whole ground turkey containers that were each a little over a pound each, we had plenty of leftovers. These meatballs easily freeze and make a quick meal on a busy weeknight or they would be great for meal prep. Prepping the meatballs takes no longer than 10 minutes. Then I bake them with some olive oil spray rather than frying to keep them leaner and lighter on the calories. Now for the sauce. I am a huge fan of a marinara sauce and have loved and used this recipe so much that I easily have it memorized. I shared it a few years ago here on the blog, but the photos are in serious need of a makeover. If you don’t have time to make your own feel free to use your favorite store bought version. You might choose to put these over pasta, spaghetti squash, eat them sandwiched on a little slider bun, or use a spirlaizer to make zucchini noodles. However you choose they will be a delicious! Pre-heat oven to 400 degrees. Spray a large baking sheet with non stick cooking spray and set aside. I use an olive oil spray. Combine all the ingredients in a large mixing bowl and shape into about 24-one inch sized meatballs. Spread the meatballs out on the prepared baking sheet. You will likely need to bake two batches. Spray the tops of the meatballs with non stick cooking spray before placing the sheet in the oven. Bake for 10 minutes, flip each meatball and bake for an additional 10-15 minutes until they are cook through. Combine with your favorite marinara sauce, pasta, or veggie noodles. Top with fresh herbs and parmesan cheese if desired. If you make these Healthy Baked Turkey Meatballs be sure to tag me on Instagram @sweetandstrongblog and use the hashtag #sweetandstrong, enjoy! Linking up with Esther, Annmarie, Farrah, and Jess for Foodie Fridays. And you can view other Healthy Recipes here. What’s your favorite type of sauce? Zucchini noodles, pasta, or spaghetti squash? Oh my gosh yes. My boyfriend and I seriously love meatballs. Im all about zoodles!! Have fun with your sister! I live in SF and used to live in LA, so I’m a Cali gal like her! Yes she LOVES living there, we grew up in the midwest so it was a lot of change when she moved five years ago. And meatballs are so versatile and always make a delicious meal, we love them! This looks so healthy and good! I hope you had a blast with your sister. Family time is the best. Thanks Julie, it’s definitely a healthy but delicious meal. And so excited for a little family time! Yum! I just got a spiralizer can’t wait to make all things spiralized! I have a veggeti and it burns my arms everytime, especially after an upper body workout. I seriously need to invest in an actual spiralizer. They are yummy and I love how quick I can make them! 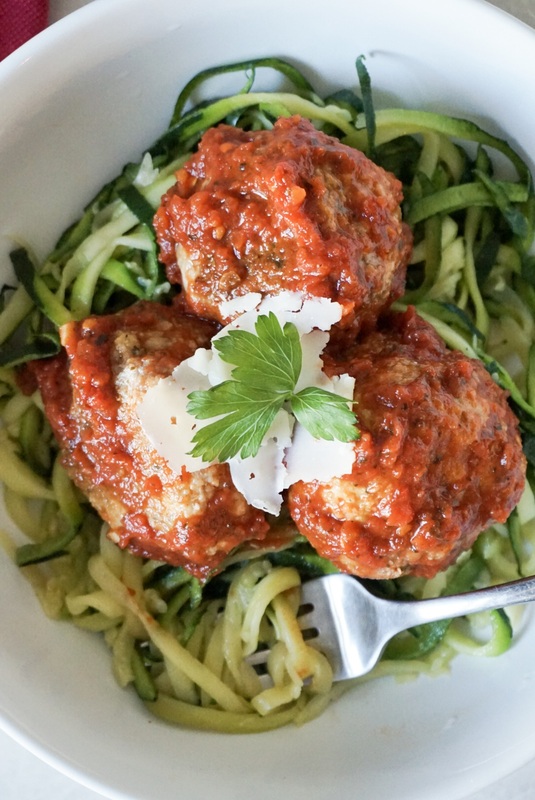 I was just talking to some one the other day about how I’ve been craving turkey meatballs – these look delicious!!! I always get cravings for them too. Or maybe I get cravings more so for the sauce, I could eat marinara like soup, so delicious. 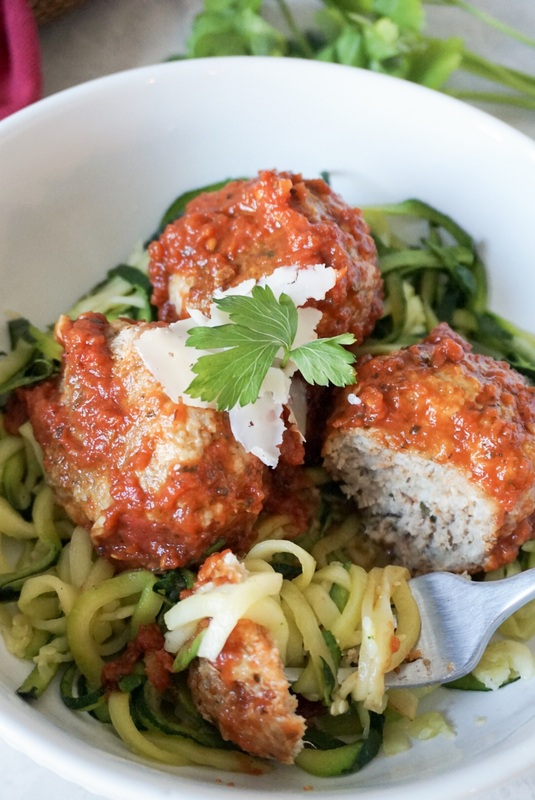 I LOVE turkey meatballs over zoodles. I will have to try yours, though I am pretty partial to mine! I love that there are so many different ways to make meatballs. I actually probably do the recipe a little different each time depending on what I have around. You make me feel so hungry at night. Turkey meetballs look so yummy and seem to be easy to cook. Thanks for your sharing. Yes they are super easy and delicious! To me, meatballs taste so much better than regular meat. I don’t know what it is but they are full of flavor! Have so much fun with your sister! Yes I feel the same way. I ordered beef meatballs and pasta at a restaurant a few months ago and was not impressed, definitely a turkey fan. I made these yesterday and they were delicious!!! I served them over penne pasta and marinara sauce, but would love to try with zoodles to make the meal healthier (although I haven’t tried to make zoodles before!!) Do you think it would be okay to freeze these? I need a spiralizer ASAP. You DEFINITELY do, they’re amazing! I love some zucchini noodles! I am making them now and they look delicious! Do you know the calorie and nutrition info on them? I do not, but I know many who use the My Fitness Pal App to calculate nutrients.